Long, long ago somewhere in Africa… When the earth and all the people and animals were new… Far into the green desert, the warthog had found an old abandoned anthill. Once, it had been the home for an enormous colony of termites but the aardwolf had eaten all the termites and left the empty mound behind. 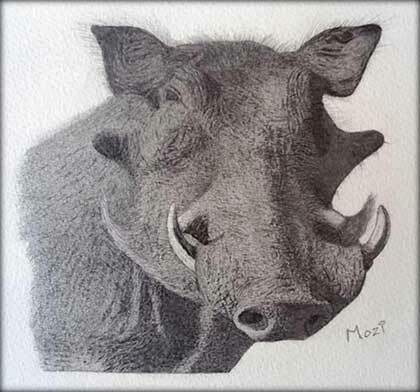 This old mound, Warthog had turned into a roomy, comfortable lair. By digging out around the opening, he had made a spacious entryway. Warthog was very proud of his impressive home and would stand at the entrance, nose in the air as the other animals passed by, on their way to the water hole. He was very satisfied that no other animal had as magnificent a home as he. One day Warthog was standing in the vestibule of his burrow, as was his custom, when to his horror, he saw a huge lion coming straight toward his grand foyer. Warthog began to back away but then he realized that the splendid entrance was now so big, Lion would have no problem coming inside.